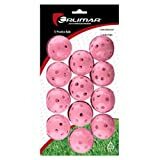 Orlimar’s Practice Balls with Holes feature a set of 12 pink practice balls made from lightweight, durable plastic. These practice balls are safe enough for practicing indoors or out so you won’t have to worry about breaking or damaging anything valuable. Golfers will surely increase their performance, consistency and maximize their swings with these practice balls! With the cost of driving range balls always rising, it’s now become cheaper and more convenient to invest in practice balls! 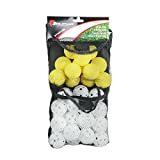 This 6-pack of white, hollowed, waffle golf balls is perfect for any player who is trying to work on the fundamentals of golf in their own backyard. These balls are flight resistant, meaning they fly only about 50% the distance of a normal golf ball. However, these durable balls provide such good feedback, it’s like practicing at your local country club. 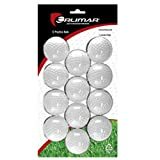 Orlimar’s Solid Practice Balls feature a set of 12 white practice balls made from lightweight, durable plastic. These practice balls are safe enough for practicing indoors or out so you won’t have to worry about breaking or damaging anything valuable. Golfers will definitely increase their performance, consistency and maximize their swings with Orlimar's practice balls! With the cost of driving range balls always rising, it’s now become cheaper and more convenient to invest in practice balls! 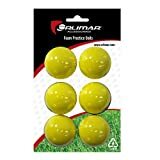 This 4-pack of yellow, foam golf balls is perfect for any player who is trying to work on the fundamentals of golf in their own backyard. These balls are flight resistant, meaning they fly only about 50% the distance of a normal golf ball. However, these durable balls provide such good feedback, it’s like practicing at your local country club.